Carrot Halwa or Gajar ka halwa as it is known in Hindi is a very popular Indian dessert made with carrots. It is a very simple and delicious dessert and can be done in a few minutes time. North Indian style of making carrot halwa is almost the same, but has more nuts and khoya is added to it (which I will share it later). Today we will learn how to make easy carrot halwa - South Indian style. Let me first wish you all a Very Happy and Prosperous New Year. Fry cashew nuts and raisins in a little ghee. Heat a tsp of ghee and fry the carrots a little. Add milk to it and cook on medium flame until all the milk evaporates. Add sugar, remaining ghee and cook on low heat until it leaves the sides of the pan. Mix cardamom powder and garnish with cashew nuts and raisins. It can be taken either hot,cold or at room temperature. Enjoy your holidays. Meet you all again in 2010 with a sweet dish. Hey Padhu, Loved the carrot cat. I too follow the same procedure and sure carrot halwa is divine either hot or cold.Awesome pic as usual. This is the cutest carrot halwa, i have ever seen!!...yummy! Tasty halwa and superb presentation. 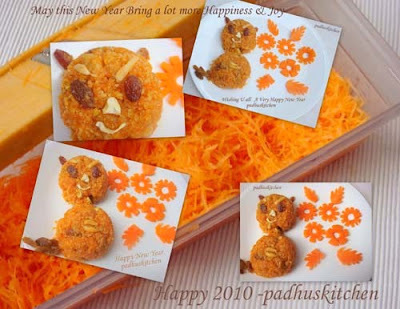 Cute presentation Padhu...halwa looks so tasty :) Happy New Year Dear! Thanks for dropping by. I loved your blog. Great recipes. Beautiful presentation..love the color you got :-) Happy New year to you too !!! 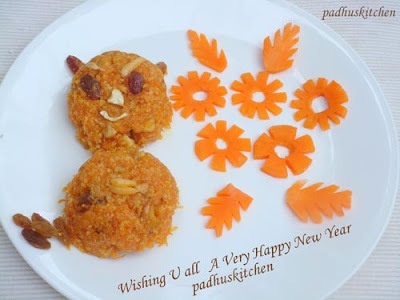 Nice presentation & yummy halwa padhu..:)Wishing u & ur family happy new year!! i really love the way you have presented looks yumm..
First time here padhu..Pictures are too gud especially loved the carrot flowers..
wow, nice presentation and vegetable carving, halwa looks totally delicious! very cute arrangement and delicious recipe! A very happy new year to you too! Wow! this is so adorable! What a brilliant idea! I'm very impressed with your creativity. looks yummy. ure really good at vegetable carvings. How cute........ Carrot halwa my all time favorite. Great dessert for this New year!!! Thanks for dropping by my blog... great work! Looks yummo!A very happy new year to you and your family, Padhu! LOve ur creative presentation. YOu always come up with such cool stuff. Carrot Halwa is my favotite Indian dessert. Urs looks so delicious and inviting. Wishing you and your family a happy, fun filled and healthy 2010. Also let me thank you for all the love and support extended to me and my blog. That surely is a great motivation to keep blogging. so cute...love this dish. This was one constant craving I had during pregnancy - would send my husband to our closest indian restaurant to pick it up at 9:30 before they close! LOL! looks very yummy!! Very nice presentation!! Great presentation! I have always wanted to learn carving veggies, it seems like it would be so much fun! Your dessert is a must try! I am a novice to cooking forced to learn it a few months back at 55years of age after loosing my wife. Yours is the only web site I refer for all my brahmin needs. As my children wanted Carrot Halwa I prepared it today exactly as per your recipe and it was simply awesome. Thank u, Thank u, Thank u for all your inputs. Thank u soooooo much... Prepared an excellent carrot halwa!!! I had tried this sweet over the weekend and I must say that it turned out to be very good. Your recipes are so simple and your website has been my site of reference for all the dishes I make. Keep it going!! I am not well used with cooking and I always visit ur site for recipe. Good work.keep rocking.. I always refer ur website for all sort if receipes. Good work..keep rocking.